Definition at line 25 of file CRDFObject.h. Definition at line 32 of file CRDFObject.h. Definition at line 23 of file CRDFObject.cpp. Definition at line 31 of file CRDFObject.cpp. Definition at line 52 of file CRDFObject.cpp. Definition at line 128 of file CRDFObject.cpp. References mBlankNodeId, mIsLocalResource, mpLiteral, mResource, mType, and RESOURCE. Definition at line 103 of file CRDFObject.cpp. Referenced by CRDFGraph::destroyUnreferencedNode(), CRDFNode::getFieldValue(), CRDFNode::setObject(), CQRDFTreeViewItem::setTriplet(), and CRDFWriter::write(). Definition at line 112 of file CRDFObject.cpp. Referenced by CRDFNode::getFieldValue(), CRDFNode::setFieldValue(), CQRDFTreeViewItem::setTriplet(), and CRDFWriter::write(). Definition at line 120 of file CRDFObject.cpp. Definition at line 94 of file CRDFObject.cpp. Referenced by CMIRIAMResourceObject::CMIRIAMResourceObject(), CRDFGraph::destroyUnreferencedNode(), CRDFNode::getFieldValue(), CMIRIAMResourceObject::setNode(), CQRDFTreeViewItem::setTriplet(), and CRDFWriter::write(). Definition at line 85 of file CRDFObject.cpp. Referenced by CRDFGraph::destroyUnreferencedNode(), CRDFNode::getFieldValue(), CRDFNode::setFieldValue(), CRDFNode::setObject(), CQRDFTreeViewItem::setTriplet(), and CRDFWriter::write(). Definition at line 97 of file CRDFObject.cpp. Referenced by CRDFGraph::destroyUnreferencedNode(), and setResource(). Definition at line 39 of file CRDFObject.cpp. References mBlankNodeId, mIsLocalResource, mpLiteral, mResource, and mType. Definition at line 55 of file CRDFObject.cpp. 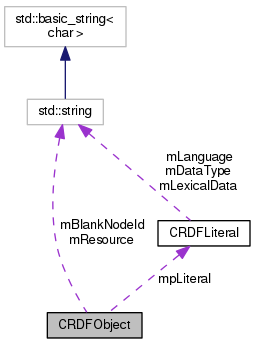 References BLANK_NODE, LITERAL, mBlankNodeId, mIsLocalResource, mpLiteral, mResource, mType, and RESOURCE. Definition at line 100 of file CRDFObject.cpp. Referenced by CRDFGraphConverter::convert(), CMIRIAMInfo::createCreator(), CMIRIAMInfo::createModification(), CMIRIAMInfo::createReference(), CMIRIAMInfo::setCreatedDT(), CRDFNode::setSubject(), and CRDFParser::TripleHandler(). Definition at line 106 of file CRDFObject.cpp. Definition at line 88 of file CRDFObject.cpp. Referenced by CRDFNode::addEdge(), CRDFGraphConverter::convert(), CMIRIAMInfo::createBiologicalDescription(), CRDFNode::setFieldValue(), CBiologicalDescription::setId(), CReference::setId(), CBiologicalDescription::setResource(), CReference::setResource(), and CRDFParser::TripleHandler(). Definition at line 82 of file CRDFObject.cpp. Referenced by CRDFNode::addEdge(), CRDFGraphConverter::convert(), CMIRIAMInfo::createBiologicalDescription(), CMIRIAMInfo::createCreator(), CRDFNode::createMissingAncestors(), CMIRIAMInfo::createModification(), CMIRIAMInfo::createReference(), CMIRIAMInfo::setCreatedDT(), CRDFNode::setFieldValue(), CRDFNode::setSubject(), and CRDFParser::TripleHandler(). Definition at line 139 of file CRDFObject.h. Definition at line 144 of file CRDFObject.h. Definition at line 149 of file CRDFObject.h. Referenced by clearData(), getLiteral(), operator=(), operator==(), setLiteral(), and ~CRDFObject(). Definition at line 134 of file CRDFObject.h. Definition at line 129 of file CRDFObject.h.